The most popular arcade ride of 1977. Fantastic artwork for Star Wars fans! A limited edition of 50 hand-numbered pieces! 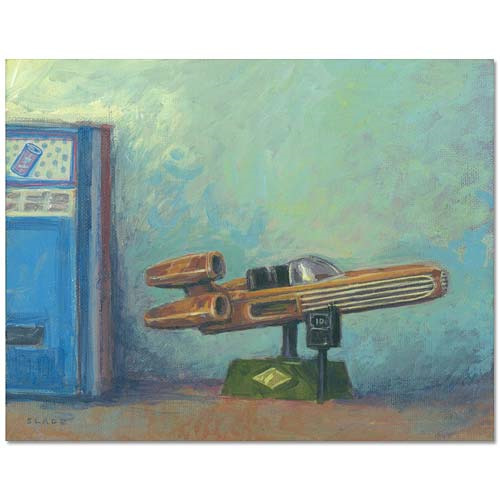 If it had only been real, the ride depicted in this Star Wars Landspeeder Arcade 1977 Canvas Giclee Print would have been the most popular thing at the arcade. Featuring an image of a 10 cent ride-on Desert Landspeeder next to a soda vending machine, this wonderful piece of artwork really captures the wishes of Star Wars fans. Measuring 11 1/2-inches wide x 9-inches tall and printed on canvas, this awesome giclee is a hand-numbered limited edition of 50 pieces, and includes a certificate of authenticity.